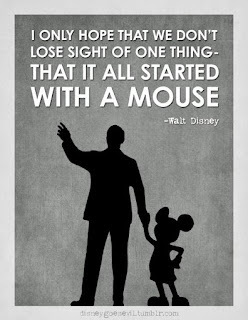 It is no secret that I'm a big fan of Disney, the man, the company, the parks and the movies. Are any of those areas perfect? Not at all. Read about the life of Walt Disney and you will see, for all of the great things he accomplished he alienated a lot of people in his life. While not perfect and throughout the mistakes he made, he never let it stop him. I think that is one of the things I love most about both the man and the company, they aren't perfect but they don't let their setbacks hold them back. I just read a great article (read it here) that recalled a story I had heard before about how in 1928 Walt Disney lost the rights to his characters and most of his animators. He remained optimistic, he didn't complain about his circumstances, he focused on what he could control and from that, in 1929 we were introduced to the iconic Mickey Mouse. This past weekend I had the privilege of helping my church to build the foundation for a new storage unit on the side of the building. It was a tremendous learning experience for me and well worth the time and the sore muscles that still haven't fully recovered. I learned a little about laying a block foundation and got to try out a few things I've never done before. The best part of the day though was getting to work beside an experienced mason. It is hard to put into words what it was like watching this man work. 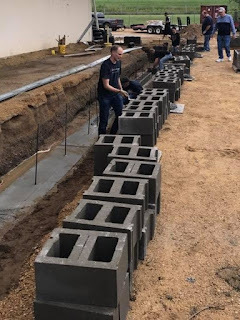 The effortless motions smoothly laying mortar, the quick placement of each block sitting in exact alignment, and the few strikes of a hammer to break a block to the exact size needed without measuring. All the time confident is his abilities but humble in his attitude. It was an honor to watch him work. One of the greatest pieces of wisdom I have ever received on how to properly lead people is, "Speak the truth in love." Now many don't want to talk about love in the same breath as managing or leading people, they don't believe in that touchy feely stuff. Others probably won't want to hear that I found it in the Bible in Ephesians 4:15. Just give me a moment though and you will see, probably from your own experiences, why it is so simple and so powerful. One phrase that I dislike more than anything is, "We've tried that before, it didn't work." I'm sure you have heard a comment like it or in some variation. I think people mean well, they want to see you succeed and help you understand the obstacles before you. They hope it is different for you but if they had to bet they would take the side of it happening just like before. However, there is a difference this time around, why it is going to work this time. That difference is you. You weren't involved in all of those other times that failed. You weren't there to help talk others through it, help them understand things, be the cheerleader, salesperson, coach, mentor and advocate that will see it through to the end. Today is one month since I moved into my new role. I told myself that for the first 30 days I was not going to offer any big thoughts or changes, I needed time to learn the business and the team. My goal was for this new team that I am a part of to learn about me, hopefully trust me and know that my priority is helping each person that I have the privileged to lead be successful and help the company we serve achieve the results they need. So, how did I do you ask? Not bad, but there were some things I certainly could have done better. One specific instance sticks out to me because this person was very upset by what they felt I was suggesting. Probably the only way to really summarize it is they felt like I didn't think they were doing their job. Living in Minnesota it is impossible to miss the natural order of seasons through the year. As the summer is winding down we are starting to think about the new school year and new dance season in our house. I have started a new job which is a new season in my life. Our kids are entering their last year of middle school, their last year of elementary school and their last year of preschool, there are all kinds of seasons changing around us. Seasons flow in all of our lives, some seasons are great for us, some are not the best, some we struggle through and some bring about the death of things we hold dear. As I reflected on this I was reminded of the following versus from Ecclesiastes 3:1-8, which many of you may recognize as they were the basis for a very famous song. When I look back on my childhood I think of myself as someone that hated to read, until I was in 9th grade that is and a teacher introduced me to Michael Crichton. I could get engrossed in one of his novels and read them straight through in a day. But really what I hated about reading was reading things that didn't interest me. If a book is about a topic that interests me, or is an engaging story that pulls me in, I love to read. Flash forward to my adult life and I have maintained a healthy desire to read and according to my wife an unhealthy habit of bringing books into our house. Reading continues to inspire me, I read business books to inspire me to be a better leader in my work place, theology books that inspire me to be a better human being and books that take me into an entirely separate worlds like The Lord of the Rings.